Eye Dull Musings: New.... ummm...err.... toys? At the karate dojo where I take classes, they also offer kobudo (i.e. weapons) classes once a week. This month we started learning to use sai. I recently bought a pair, pictured above. And, yes, for any kids reading this (Hi Beth! 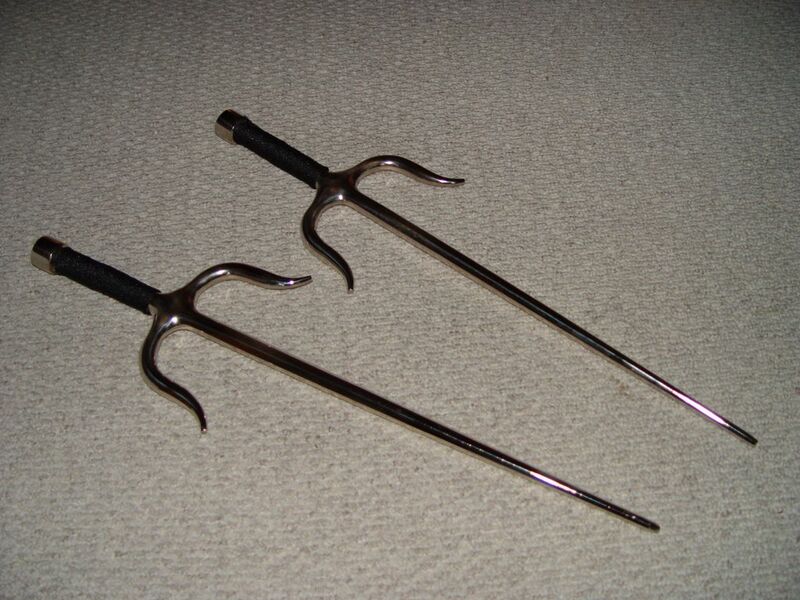 ), sai are the weapons the ninja turtle Raphael uses. The kobudo classes are a lot of fun - they are less physically tiring than a normal karate class, but have a bit more of a mental focus since you need to learn a lot of new techniques for manipulating the weapons and such. I'm not sure why, but I find it easier to remember the details for the various weapons kata than for normal karate kata. (For those not familiar with the term 'kata', you can think of it as a series of choreographed steps which are practiced to help improve your karate techniques.) I think one of the reasons I find kobudo easier to learn is because I focus more on the item in my hand (be it a bo or sai) and there are only a few ways you can physically hold the item correctly, so the weapons sort of force you into knowing what is the next step. As for regular karate, with nothing in my hands, I tend to get lost more easily when learning a new kata. There are just so many ways you might need to bend your arm, or wrist, or leg, there's no extra visual cue like when you have with a weapon in your hand. Thinking about it some more, I think kobudo is also more relaxing for me because I feel some of the attention is taken away from me personally and is placed on the weapon, so I tend to feel a bit less self-conscious, which in turn helps me relax more. wooo that's a very cool weapon...Elektra uses it in the movie Daredevil...cool blog...! !